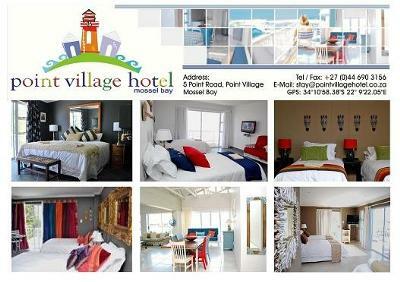 Point Village Hotel is nestled at the side of a quaint village at The Point in Mossel Bay. Mossel Bay is a popular tourist destination located along the sandy shores of the Indian Ocean. Schools of dolphins like The Point so much that they visit us twice a day! Why the Point Village Hotel? The atmosphere is chic yesterday that blends with modern today in a relaxing holiday feeling. In Mossel Bay every day is a lazy Sunday - simply relax, do nothing and just experience the magic of being just you. On the other hand Mossel Bay also offers you a wide variety of activities. Never a dull moment and in a different unnoticed fashion. Here we don’t hurry, so don’t worry!